Matching Details In A Great Shelford Orangery. The owners of this contemporary house in Great Shelford loved their home but the one thing that was missing was the space to gather together to cook, to eat and to entertain. Although their home was substantial, the existing layout included separate spaces for living, dining and cooking. Wanting to create a space where everyone could hang out together was the motivation for contacting the Cambridge Conservatory Centre. 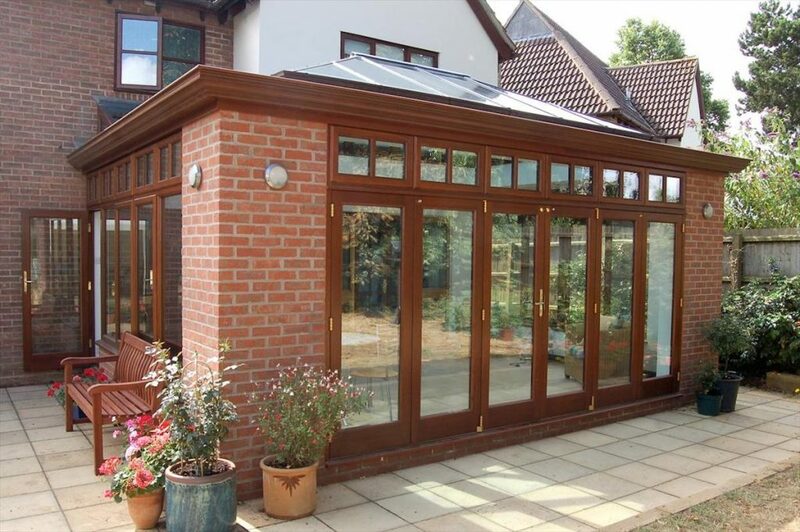 We discussed the options and suggested a Hardwood Orangery that would be built using brick that matched the home and a frame that would be stained to match the colour of the existing window and door frames. The natural place to position the Orangery was in front of the feature double height gable that housed the kitchen. Not only would this provide a practical link to the existing cooking and eating areas, but it would provide a great view of the garden without impinging on the space too much. As you can see in the image above, the Orangery sits perfectly in it’s new surroundings and enhances the proportions of an already expansive home. 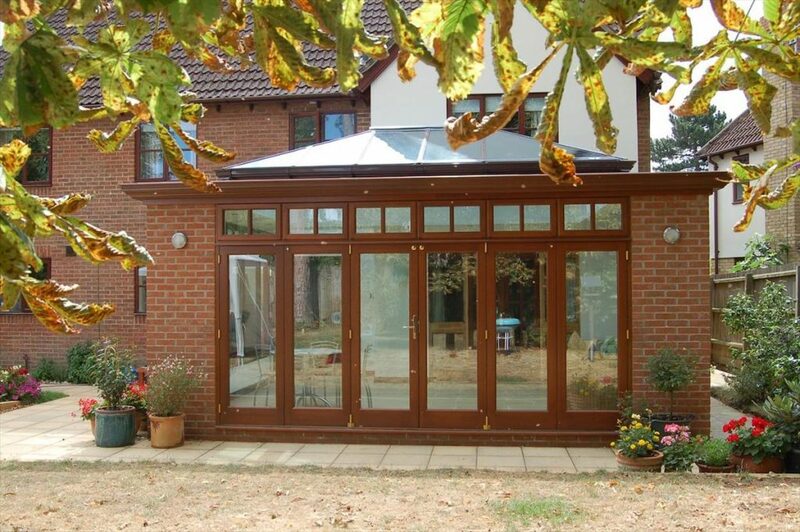 At 6m x 4m this Hardwood Orangery needed planning permission to be built, however we handled all of that for the owners ensuring a smooth build for them. A wide set of six panel folding doors hung on easy to use catches allow one entire wall to be folded back. Roof windows provide ventilation and the white tiles floor maximises the light not only in the Hardwood Orangery, but also in the existing kitchen beyond. 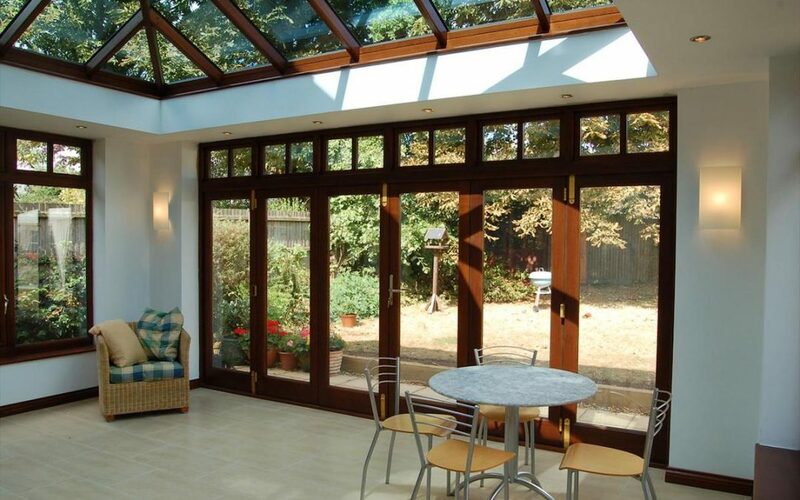 To the side, there is another set of doors which allows the new Hardwood Conservatory to feel more like an outdoor room when all the doors are open. Its almost like sitting outside and the connection to the garden is obvious. Now the family can gather together to cook, to eat and to enjoy each others company. And on special days, or any day they choose, they can transform this wonderfully large and light space into a delight for their guests whatever the weather.